The hype in the satellite industry for the past few years has been all about Ka-band and tens to hundreds of megabits of throughput to small and-on-the move terminals. Multi-gigabit links from MILSATCOM programs like Wideband Global SATCOM (WGS) and the Transformational Satellite Communications System (TSAT) have been a major focus as well for a community whose data requirements are increasing at an exponential rate. Yet, while much of the attention has remained focused on wideband communications, its important not to forget the continued demand for narrowband offerings for users who need secure voice, text and low-data-rate critical communications. Simply put, wideband is great, but narrowband is critical. Theresa Beech is responsible for overseeing all aspects of GMV USAs business development and contractual agreements, as well as coordinating GMVs business strategy worldwide. She has been jointly responsible for the set-up, launch and successful growth of the company in the United States and expanded presence worldwide. RF links in military communication are ubiquitous, from just a single antenna used by mobile troops right up to the large satellite dish farms used for government monitoring. Tactical UHF/VHF radio links, communication buoys and secure network data centers all use RF links. However, the traditional copper cable link between the antenna and control station has significant performance limitations and is not secure. In contrast, optical fiber is lightweight, inherently secure and incurs negligible signal losses, bringing flexibility to the design of fixed installations and mobile applications. There has been a lot of discussion over the past year about how the commercial space industry can be leveraged by the U.S. Government to achieve its goals of resilience, affordability, risk reduction and increased flexibility, capability, and capacity for national security, space exploration, and science missions. Dr. John Paffett is chief executive officer for Surrey Satellite Technology US LLC (SST-US), the United States subsidiary of world-leading small satellite manufacturer Surrey Satellite Technology Limited (SSTL). SST-US was created to serve the U.S. market with rapid, cost-effective small satellite systems, applications, and services. John is also director of telecommunications and navigation for SSTL with responsibility for those programs and the group strategic development activities, as well as chief executive officer of Surrey Satellite Services Limited, the SSTL subsidiary responsible for provision of launch and launch service activities. Ulf Sandberg has 25 years experience in the global satellite and telecommunications world. After completing his MSc in Physics at the Royal Institute of Technology in Stockholm, he served in the Swedish Armed Forces. From there Sandberg joined Notelsat, the operating company for Tele-X, one of the earliest Nordic Communication satellites. From there, he was with the Swedish Attaché for Science and Technology office, based in the USA. Leaving the Government sector, Mr. Sandberg worked for Swedish Telecom International and then Unisource, where he advanced to be Managing Director for the satellite business based in the Netherlands. As well as Versatel in the Netherlands, Mr. Sandberg was also involved in the start-up and creation of a number of companies and ventures in Europe and the USA. In 2012, the DoD will spend approximately $1 billion buying capacity on commercial communication satellites. That capacity will fulfill about 80 percent of the total satellite communication needs of the Department, the remainder being filled by government-owned satellites. This arrangement between the government and industry has evolved over time as the capacity needed to support a variety of bandwidth-hungry applications has exploded, and the capacity of government-owned systems has lagged. 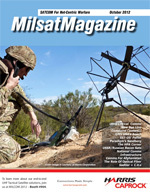 With the deployment of the governments Wideband Global SATCOM constellation, the Defense Department will take a bite out of commercial demand, but the continual fielding of ever more demanding sensors and applications is likely to result in the need for a huge amount of commercial capacity for as far as one can see into the future. Similar to the United States, the former Union of Socialist Soviet Republics recognized the value of military reconnaissance satellites early in their development of spaceflight. In doing so, the USSR took a standard spacebus that was being developed for its manned program and fitted craft with specialized equipment. As is the case with U.S. military programs, details of the USSR/Russian programs are classified and the minimal of information that is known is mostly gathered by western observers. To add to the secrecy, the USSR/Russian photo reconnaissance satellites are included in the all-purpose Kosmos series of satellites which began in 1962 and had reached 2,481 in number by the close of August 2012.